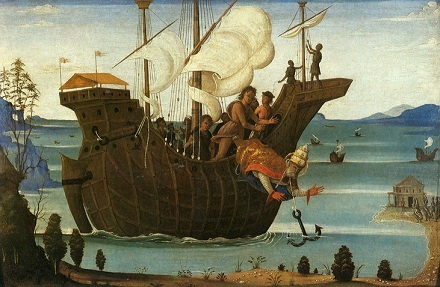 The Martyrdom of St. Clement, by Bernardino Fungai. The documentary trail for leadership of the Christian community in these embryonic years is a little thin but officially, the Vatican rates Clement the fourth Pope following St. Peter, Linus, and Cletus; Tertullian says he was ordained by Peter’s very own hand. He’s the earliest of these successors of the Apostle who can still speak to posterity. The First Epistle of Clement,** which might very well be from the pope’s own hand, is among the oldest extant Christian texts outside of the books actually gathered in the New Testament. Clement wrote it to recall the Corinthian congregation to obedience after “no small sedition” challenged its presbyters; by way of a voluminous review of authority both scriptural and natural,† the Bishop of Rome unsurprisingly concludes that folk ought submit to the constituted ecclesiastical authorities. Forasmuch then as these things are manifest beforehand, and we have searched into the depths of the Divine knowledge, we ought to do all things in order, as many as the Master hath commanded us to perform at their appointed seasons. Now the offerings and ministrations He commanded to be performed with care, and not to be done rashly or in disorder, but at fixed times and seasons. And where and by whom He would have them performed, He Himself fixed by His supreme will: that all things being done with piety according to His good pleasure might be acceptable to His will. They therefore that make their offerings at the appointed seasons are acceptable and blessed: for while they follow the institutions of the Master they cannot go wrong. For unto the high priest his proper services have been assigned, and to the priests their proper office is appointed, and upon the levites their proper ministrations are laid. The layman is bound by the layman’s ordinances. Let each of you, brethren, in his own order give thanks unto God, maintaining a good conscience and not transgressing the appointed rule of his service, but acting with all seemliness. Not in every place, brethren, are the continual daily sacrifices offered, or the freewill offerings, or the sin offerings and the trespass offerings, but in Jerusalem alone. And even there the offering is not made in every place, but before the sanctuary in the court of the altar; and this too through the high priest and the afore said ministers, after that the victim to be offered hath been inspected for blemishes. They therefore who do any thing contrary to the seemly ordinance of His will receive death as the penalty. 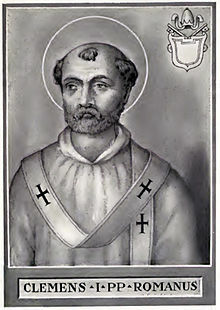 Presumably in consequence of the device used to sink the pope into the Euxine, St. Clement is honored as the patron of smiths and metalworkers; little-observed now, St. Clement’s Day once saw clanging processions of cloaked, and tanked, blacksmiths answering to Old Clem and belting out tunes at every tavern they passed. Pyromaniacs and Warner Brothers cartoon characters might also wish to honor St. Clement with a good old-fashioned anvil firing. * Chersonesus, which is the city where the prince Vladimir the Great was baptized en route to Christianizing all of Russia, has gorgeous ruins that can be seen adjacent to present-day Sevastopol. St. Cyril, missionary to the Slavs and fountainhead of the Cyrillic alphabet(s), is supposed to have dug up Clement’s relics during his sojourn and hauled them, anchor and all, back to Rome. ** There’s a Second Epistle of Clement, too, but it is not thought to be a genuine product of Clement. † And unnatural! Viz. “There is a bird, which is named the phoenix. This, being the only one of its kind, liveth for five hundred years; and when it hath now reached the time of its dissolution that it should die, it maketh for itself a coffin of frankincense and myrrh and the other spices, into the which in the fullness of time it entereth, and so it dieth.” The phoenix is supposed to be evidence and/or metaphor for the Resurrection and the afterlife.